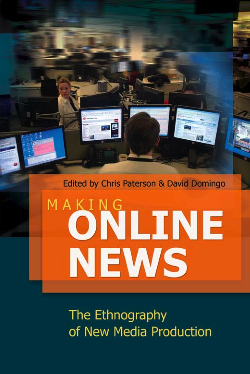 David Domingo and Chris Paterson have published a new book: Making Online News. The Ethnography of New Media Production. Paterson and Domingo are the editors of a dozen chapters with researchs by researchers like Edgardo García (Argentina), Thorsten Quandt, Anthony Cawley, Jane Singer, etc., and an epilogue by Mark Deuze about a sociology of online news. The book claims for recovering the sociology and ethnography practised in newsrooms durin the ‘70 by, amongst others, Gaye Tuchman. The guiding premise of this work is “that only ethnographic methofdologies derived from anthropological and sociological traditions can como close to provinding an adequate description of the culture and practice of media production, and the mindset of media producers”. “This is impossible with other methods”, conclude the editors, “such as surveys or web content analysis -the dominant modes of online news research”. Being a practitioner of such “obsolete” methods, including hypertext theory applied to journalism, I do find complementary both traditions, aren’t they? [For people abroad, David Domingo, me and 22 researchers are collaborating on a study of convergence in Spanish newsrooms, conducted by professor Ramón Salaverría, with optimal results!]. David Domingo, after a couple of years as a visiting professor in Iowa University, has recently returned to the Rovira i Virgili University in Catalonia. Welcome back, David! Domingo, David; Paterson, Chris. Making Online News. The Ethnography of New Media Production. New York etc. : Peter Lang, 2008.